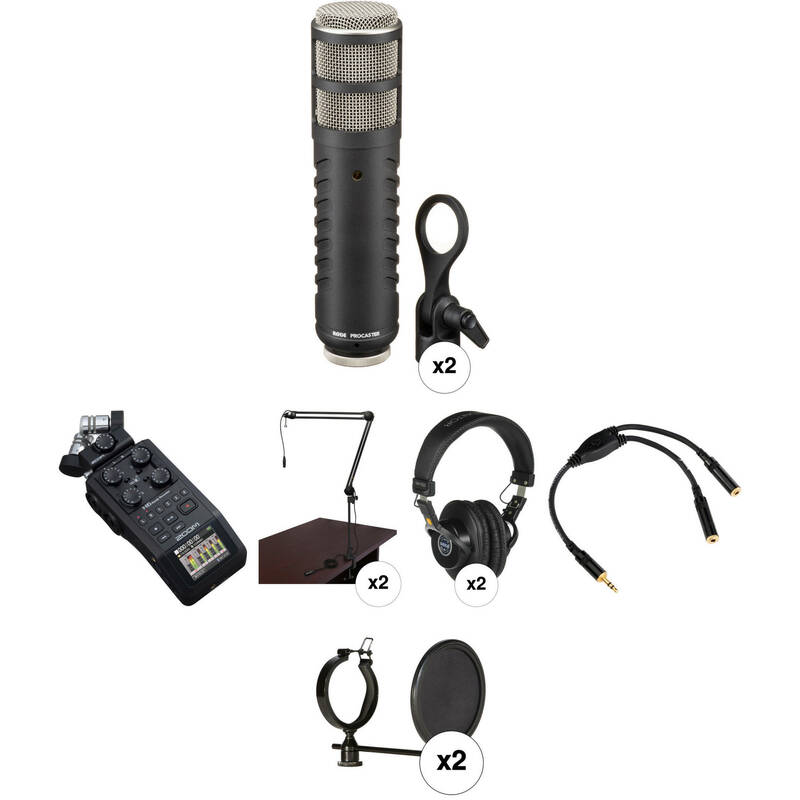 This Zoom H6 Recorder Podcast Kit with Two Rode Procaster Microphones from B&H brings the elements necessary to begin recording a 2-person podcast within minutes of opening the box. The Rode Procaster is a broadcast-quality, dynamic microphone that does a great job capturing speakers near the mic, but without picking up unwanted sounds further away. The included Auray two-section broadcast arms make positioning the mics a snap. The arms' integrated XLR cables plug right into the H6 recorder, which features high-quality mic preamps and records to an SD card. Two pairs of Senal SMH-1000 around-ear headphones are included to provide precise monitoring in comfort for both the host and the guest. When you're ready to add more guests to your podcast, the H6 can be expanded to accommodate up to six mics with the EXH-6 dual XLR/TRS combo input capsule (available separately). The recorder also features easy-to-reach controls and a large, full-color LCD display angled so it's easy to read in all environments when making on-the-fly adjustments or editing in the field. The system is fully standalone but also ready to interface with a computer for live streaming or for more elaborate post-production work. The Auray BAI-2X is a two-section broadcast arm with internal springs and an integrated XLR cable. This versatile and sturdy broadcast arm is great for studio as well as home use. It's ideal for broadcast, voiceover, and podcasts. The BAI-2X broadcast arm is designed with internal springs that provide a clean and sleek look. The internal balance springs are precision engineered to support and hold in place microphones of up to 5 lb. (2.27 kg). The design also minimizes handling noise when re-positioning the arm. The broadcast arm features a standard 5/8"-27 microphone stud mount that is compatible with most shockmounts and microphone clips. The angle of the microphone stud mount can be adjusted and secured with the locking knob, and the angle is maintained when re-positioning the arm. This eliminates the need to readjust it every time the arm is moved. With an extension of up to 40 inches, and the ability to rotate the arm 360°, the BAI-2X allows for precise microphone placement. The BAI-2X also features a heavy-duty combo mount that consists of a sturdy C-clamp and a heavy-metal desktop mount. The C-clamp is capable of fastening onto desktops up to 2.3" thick. The C-clamp's slim design minimizes the clearance needed to mount it between a desk and wall. The desktop mount detaches from the C-clamp and provides the option of permanent installation to a desktop with the mounting screws (included). A 14" riser is included for adding height to the broadcast arm in order to extend over computer or studio monitors. The 1/8" Stereo Y Cable from Kopul features a 1/8" stereo male TRS connector that splits to two 1/8" stereo female TRS inputs, allowing you to split a stereo signal, such as a headphone output, to two stereo outputs. It features a premium OFC spiral-shielded cable for reduced EMI and is 8-inches in length. Its gold-plated metal connectors are manufactured by Rean, a trademark of Neutrik. Box Dimensions (LxWxH) 11.2 x 5.3 x 2.6"
Box Dimensions (LxWxH) 23.5 x 7.4 x 3.5"
Box Dimensions (LxWxH) 6.2 x 4.0 x 1.0"